Early in the season, N deficient leaves are small and pale green. Shoot growth may be reduced and foliage sparse. In fall, leaves from N deficient trees turn yellow and fall early [N4]. High N supply can increases the severity of fungal diseases. Teviotdale [N33] investigated the effect of four N fertilization levels, ranging from 0 to 500 lbs/acre, on fungal diseases in commercial almond orchards in Stanislaus County. The incidence of brown rot blossom and twig blight, shot hole, scab, and hull rot increased with increasing nitrogen application rates up to 250 lbs/acre [N33]. Increasing the N application rate above 250 lbs/acre did often not increase the severity of the diseases. Traditionally, leaves for tissue analyses have been sampled in July. The results allow tracking changes in the nutrient status of the orchard, but at the time the results are available it may already be too late to correct for nutrient deficiencies. Recent research by Brown and coworkers has shown that samples taken in April can be used to predict the July leaf N status (see below) [N8, N28]. The results can be used to make in-season fertilization adjustments. Divide the orchard into uniform blocks of trees with respect to soil type, age of trees, variety, location and management. A separate sample should be submitted for analysis from each block. Avoid collecting from sick, injured or stunted trees. Collect leaves from 28 trees, which are at least 30 yards apart. In each tree collect leaves around the canopy from at least 8 well exposed spurs located at a height of 5 to 7 feet. Place the samples in paper bags (use separate bags for each block) and label the bags. Keep the leaves cool and send or deliver the samples to the lab as quickly as possible. For spring samples, ask for a full nutrient analysis (N, P, K, B, Ca, Zn, Cu, Fe, Mg, Mn, S). For samples taken in spring, predict the July leaf N concentrations using the leaf N model. It’s good practice to bring a notepad along to record tree vigor in the different blocks. The information together with the laboratory analyses and yield data can help with future fertility planning [N27]. With measured or predicted July leaf N concentrations below 2%, almond trees are considered N deficient, and yield may be reduced by 20% or more [N32]. A leaf N concentration of 2.2% is generally adequate (see Table) [N1, N4]. However, in some cases almond yields have been found to be reduced with leaf N concentrations of 2.2 to 2.3% [N29]. This may be due to the fact that most critical values for almonds have been determined on the basis of visual symptoms [N4]. Therefore, the critical values refer to a tree. In contrast, the results from leaf analyses refer to the average of all trees sampled in the orchard with some trees being below and others above the average [N2]. In a heterogeneous orchard, some trees may be deficient even when the leaf N concentration of the orchard is well above 2%. For this reason it is important to divide an orchard into uniform blocks with respect to soil type, age of trees, variety, location and management and sample each block separately. Critical nutrient levels in almond leaves sampled in July [N1, N4, N32]. However, by maintaining an orchard at 2.5% field average, the majority of the trees will most certainly be over-fertilized (Brown, personal communication). If leaf N concentrations are well above the sufficiency level, the post-harvest application rate should be reduced, but not eliminated [N17]. The almond fertilization model suggests reducing the N application rate by 14 lbs/acre for each 0.1% increase in leaf N concentration above 2.3% [N9]. Contact your local farm advisor for more information. Nitrogen fertilizers need to be applied with care to young trees, as high N concentrations in soil solution may burn the roots. A good rule is to apply no more than one ounce of N per tree per year of growth with a single application [N21, N13]. One ounce of N per tree corresponds to 5-9 lbs N/acre, depending on tree density. For the first application to first leaf trees, even less than one ounce of N should be applied [N13]. The rate should also be reduced for stunted trees and in hot weather when the trees take up a lot of water. Under these conditions, lowering the rates per application and instead increasing the number of applications reduces the risk of leaf burn [N13]. A total annual application of up to 4 ounces/tree (20-35 lbs/acre) to first-leaf trees may increase growth, while higher rates have no benefits [N18]. Granular fertilizers should be placed at least 18 inches from the trunk, but within the wetting zone of the irrigation system [N21]. When N is fertigated, the fertilizer should be injected into the irrigation system in the middle third of the irrigation set [N25]. For example, in an 18-hour irrigation set, fertilizer is injected from hour 6 through hour 12. This prevents urea and nitrate from moving below the root zone but still ensures that the N is distributed well in the wetting zone. The risk of root burn is increased with liquid fertilizers, as their application may result in high concentrations in the root zone. Therefore, as a measure of caution, granular fertilizers should be used for first-leaf trees [N21]. Blends, such as 15-15-15 or 12-12-12 also supply K and P [N13, N21]. To second-leaf trees, liquid fertilizers, such as UN-32 or CAN 17 can be applied. To ensure sufficient P and K availability, a granular NPK fertilizer may be used for the first application of the year [N13]. 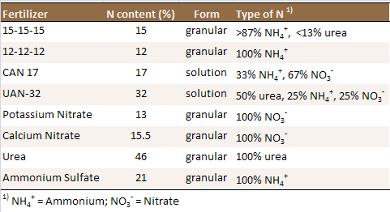 In early spring, when the soil is still cooler, nitrate based fertilizers may be more efficient than urea or ammonia fertilizers [N13]. However, nitrate is very mobile and may move quickly below the still small root zone of the young trees. Therefore, careful irrigation management is important to prevent nitrate from leaching below the root zone. Fertilizer should not be applied to recently planted trees until spring after the trees leaf out [N21]. Further applications, if needed, can be made every 4-6 weeks [N13]. In a four-year study carried out at multiple sites, Brown and coworkers found that the amount of N removed at harvest with hulls, shells, leaves, debris, and kernels ranges from 50 to 75 lbs/1000 lbs of kernels, averaging 68 lbs/1000 lbs of kernels [N28]. In addition, almond trees need nutrients for the growth of perennial parts, such as roots, trunk and branches. The N in the perennial parts of 9 to 13 year old trees increased annually by 25-30 lbs/acre, with 12 year old trees containing about 450 lbs of N [N3]. Based on these and earlier trials, the team led by Patrick Brown developed a computer based N management program [N5, N9]. The annual N application rates listed in the table below do not include adjustments for cover crops, organic fertilizers, N in irrigation water and high leaf N concentrations. For a detailed calculation of N application rates and the time of application, see the almond fertilization model. An updated version is available on the website of the Almond Board of California. The N application rate needs to be adjusted for N contained in the irrigation water. In a study conducted in 2000 in selected orchards in the Sacramento Valley, the N input with the irrigation water averaged 9.3 lbs N/acre-foot with values ranging from 0 to 28 lbs N/acre-foot of irrigation water [N10]. Therefore, 27.9 lbs N/acre are applied with a seasonal application of three acre-feet of water containing 9.3 lbs N/acre-foot. Contact your local farm advisor for more information. In orchards with flood irrigation or solid set sprinklers, the fertilizers should be applied in the herbicide strip along the tree rows and not broadcast over the entire area. Fertilizer applied between the rows is less efficiently used due to competition with weeds or cover crops and lower almond root density compared to the tree row [N26]. Surface applied N should be incorporated or irrigated into the root zone shortly after application [N11]. This is especially important when fertilizers containing ammonium or urea are used in hot, windy weather and on soils with an alkaline pH because these factors increase ammonia volatilization. In orchards with microsprinkler systems, the fertilizer should be injected into the irrigation system in the middle third of the irrigation set. For example, in a 18-hour irrigation set, fertilizer is injected from hour 6 through hour 12. This prevents urea and nitrate from moving below the root zone but still ensures that the N is distributed well in the wetting zone [N25]. A number of mineral N fertilizers are available to growers (see Table). Mineral fertilizers contain N in the form of urea, ammonium, nitrate, or a mix of them. When losses are minimized and equal amounts of N are added, the effects on yield of these fertilizers are generally quite similar [N6, N7, N26]. The N forms however behave differently in the environment. Nitrate is very mobile in the soil and can easily be leached below the root zone with irrigation water or rain. Ammonium is less mobile, but is generally converted quickly to nitrate by soil microorganisms, especially in warm and moist soils, unless they are water saturated. This process, nitrification, can lower soil pH. The acidifying effect is especially strong when ammonium fertilizers are applied by drip systems as they are concentrated in a small soil volume [N34]. Ammonium may volatilize as ammonia, especially when applied to the surface of dry and alkaline soils without incorporation. Urea is relatively mobile in the soil, but is generally quickly converted to ammonium. More detailed information about the most common fertilizers can be found on the IPNI homepage. In a study carried out with FREP support, Brown and coworkers found that 13% of the total N is taken up during spring flush (January to mid-March), 42% between spring flush and nut fill (mid-May), and 45% during the summer [N5]. About 80% of the N in the fruits is taken up before mid-June [N7]. Two thirds of the N needed during spring flush is transferred from the trunk and roots, reducing the need for spring-applied fertilizer N.
Based on their research, Brown and coworkers developed an almond fertilization model [N5, N9]. An updated version is available on the website of the Almond Board of California. The model recommends applying 30% of the total N in March/April, 40% in May/June, and 30% in June/July [N9]. Nitrogen and other nutrients move from the roots to the leaves and fruits with the water taken up. Transpiring leaves create a suction which results in an upward movement of water and nutrients from the roots to the shoots [N15]. While almond trees may take up some nitrate pre-bloom during bud-swell, the amount of N taken up between leaf fall and leaf-out is minimal due ot lack of transpiring leaves [N31]. Therefore, most of the N applied between late fall and spring will not be taken up by almond trees before leaf-out. This increases the risk of nitrate leaching below the root zone. The risk of leaching losses is especially high in sandy soil and areas with higher winter rainfall. In order to minimize nitrate leaching losses, the first application should be done after leaf-out [N14, N15]. The N demand of almonds is highest between bloom and mid-June [N3, N26]. During this period it is very important to provide the trees with sufficient N. Most of the N is taken up by the end of June. For the subsequent kernel growth, most N is translocated from the hull and shell to the kernels [N30]. Nitrogen applied late in the season after kernels have developed will be directed into the hull and has no effect on yield. In contrast, it may increase the risk of hull rot [N12]. A post-harvest application supports the development of next year’s blossoms, immature fruits and earliest leaves [N31]. The application should be made as soon as possible after harvest to ensure that the N is taken up before leaf fall [N31]. If a significant leaf loss has occurred already due to pest pressure or drought, the last application should be reduced or skipped [N26]. The post-harvest N application should also be reduced when the July leaf N concentrations are 2.8% or higher [N16]. Contact your local farm advisor for more information. The effects of foliar applications to almonds have not been studied widely. The data available suggests that well fertilized trees do not benefit much from additional foliar applications. In a two-year study carried out in an orchard on an Arbuckle gravelly loam, Meyer and coworkers [N24] did not find consistent effects on kernel yield and leaf nutrient concentrations due to up to three spring foliar applications of different combinations of N, P and K, applying up to 35 lbs N/acre. Foliar fertilizers were applied in addition to 160-190 lbs/acre soil applied N. Almond meat yields ranged from 1500 to 2100 lbs/acre. In a trial conducted by Duncan, fall applications of 25 lbs/acre of urea to healthy almond trees slightly increased yield, while higher application rates had no effect. None of the observed differences were statistically significant [N19]. However, fall urea application increased the resistance of peach trees to bacterial canker [N20]. Klein and Weinbaum [N22] found that a foliar application with a 0.5% urea solution did not cause noticeable leaf damage to mature Nonpareil almond trees, while a 1% solution caused slight marginal and tip necrosis. The same study showed that 85% of the urea was taken up within 24 hours. Meyer and coworkers [N24] also observed leaf tip necrosis in one out of three years with solutions containing 0.55% N, which corresponds to 1.2% urea. Tip burn on ‘Butte’ almond leaves caused by foliar urea application. Leaves were samples after a post-harvest (October) application of 5.4% low-biuret urea solution containing 20 lbs N/100 gallons of water (photo provided by Franz Niederholzer). Urea and fertilizers containing N in the form of urea are most often used. Using low-biuret urea reduces the risk of leaf damage. Foliar N can be applied in spring or fall. Fall applications need to be done while the leaves are still active. 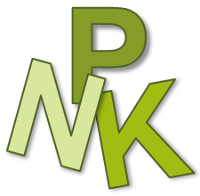 Meyer and coworkers reported applying foliar fertilizers pre-bloom, when the tip of the bloom was pink, 30 days later and 60 days after the pre-bloom application [N24]. The risk of leaf damage is greatest before harvest (Niederholzer, personal communication), but may accur at other times as well. 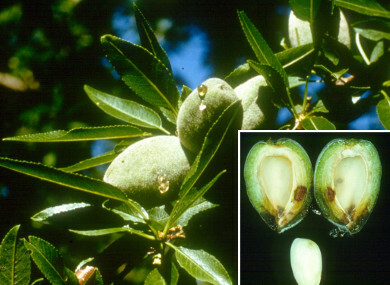 Phosphorus deficiency of almond trees is uncommon in California. When P supply is insufficient, leaf and shoot growth is reduced. However, distinctive symptoms are not displayed [P3]. For more information about soil P availability in your area, contact your local farm advisor. Soil samples for P analysis should be taken from the main root zone. Even though almond roots may grow to a depth of 5 to 7 feet [P1], the majority of the roots can be found in the top two feet of the profile [P1, P9]. The lateral root expansion may reach 8 to 12 feet from the trunk with the highest density being found within 4 to 5 feet of the trunk in the zone wetted by the irrigation system [P1, P9]. For detailed sampling instructions see Soil Sampling in Orchards. Phosphorus availability strongly depends on soil pH. In acidic soils, P is immobilized by iron and aluminum minerals, while in alkaline soils the predominant mechanism of P immobilization is the formation of insoluble calcium phosphate compounds [P7]. For this reason, the recommended soil test depends on soil pH. For acidic to neutral soil (pH < 7.0), the Bray P1 test is generally used. For neutral and alkaline soils (pH > 6.5), the Olsen method is more appropriate [P10]. Using a test that is inappropriate for the soil analyzed may result in inaccurate results. For intermediate soil P values (see Table), only the amount of P removed at harvest needs to be replaced with fertilizer. With each 1000 lbs of harvested kernels, approximately 8 lbs P/acre (18 lbs P2O5/acre) are removed from the orchard with kernels, shells and hulls [P4]. Similar values have been reported from studies carried out in Spain [P15, P16]. Interpretation of soil P and K test results [P10]. For low soil test P values, the application rate should be increased, while for high values it can be reduced. Little data is available about the amount to apply in these cases. A reasonable approach may be to increase P applications by 50 or 100% when the soil P test value is low or very low, respectively. When the soil P test value is high or excessive, the application rate may be reduced to 50 or 0%, respectively. Over the years, the soil P test values should reach and remain at the intermediate level. Regular soil and leaf analyses indicate whether the P fertilization program is adequate. In acidic and alkaline soils, low P availability should first be addressed by correcting the pH of the soil. Phosphorus availability is highest in soils with a pH close to neutral (pH 7). Contact your local farm advisor for more information. It’s good practice to bring a notepad along to record tree vigor in the different blocks. The information together with the laboratory analyses and yield data can help with future fertility planning [P13]. Phosphorus concentrations between 0.1 and 0.3% indicate adequate P supply [P3]. Critical nutrient levels in almond leaves sampled in July [P2, P3, P17]. Phosphorus deficiency has rarely been observed in deciduous orchards in California. However, the application of P to young almond trees may promote root growth. Using blends, such as 15-15-15 or 12-12-12 is a good way to supply some P and K to first and second-leaf trees [P8, P11]. The amount of fertilizer added with blends and the time of application are generally based on the N demand. Granular fertilizers should be placed at least 18 inches from the trunk, but within the wetting zone of the irrigation system [P11]. Phosphorus deficiency has rarely been observed in deciduous orchards in California. There are currently no University of California recommendations for P fertilization of almond orchards. Soil and leaf analyses can be used to monitor the P status of an orchard over the years to ensure that the P availability is adequate (See Soil Test and Leaf Analysis). On the long term, the amount of P removed at harvest needs to be replaced with fertilizer when the soil or tissue P values suggest adequate P availability. Between 8 and 9 lbs P/acre (18-20 lbs P2O5/acre) are removed from the orchard with kernels, shells and hulls with each 1000 lbs of harvested kernels [P5]. Similar values have been reported from studies carried out in Spain [P15, P16]. For low soil or leaf P values, the application rate should be increased, while for high values it can be reduced (see Soil Test). Contact your local farm advisor for more information. Broadcast applications of P have been found to be less effective than strip or ring applications at the drip-line of the tree [P2]. As P is strongly immobilized by soil minerals, it cannot be leached into the root zone with irrigation or rainwater and should be incorporated into the soil for better availability. Phosphorus fertilizers can be drilled 6 to 8 inches deep in one or two bands on opposite sides of the tree row [P2]. Phosphorus can be fertigated; however care must be taken to prevent the formation of calcium phosphates which can plug the emitters [P6]. The effects of foliar P applications to almonds have not been studied widely. The data available suggests that well fertilized trees do not benefit much from additional foliar applications. In a two-year study carried out in an orchard on an Arbuckle gravelly loam, Meyer and coworkers [P12] did not find consistent effects on kernel yield and leaf nutrient concentrations due to up to three spring foliar applications of different combinations of N, P and K, applying up to 3.2 lbs P/acre. Leaves of K deficient trees first turn pale green. Later, the tip and edge of the leaves turn brown and the tissue dies (necrosis). Leaf tips curl upwards. Symptoms are first visible in late spring, early summer. The first leaves to show symptoms are generally those along the middle of the shoots. 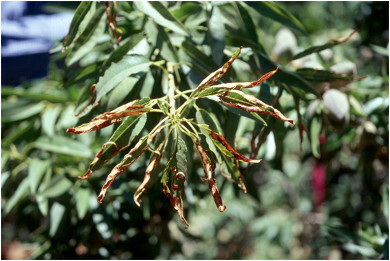 Symptoms of K deficiency normally begin in the tops of trees but can be distributed throughout the tree when deficiencies are more severe [K14]. When K supply remains low, all leaves eventually show symptoms [K4]. Other symptoms of K deficiency include reduced growth of leaves and shoots, smaller nuts and accelerated premature leaf senescence and premature leaf abscission [K1]. 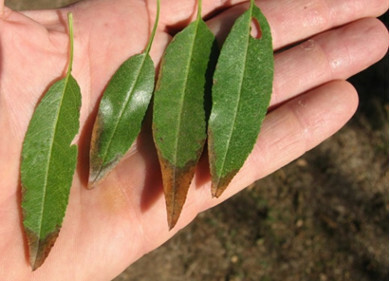 Potassium deficiency symptoms on almond leaves (photo provided by the International Plant Nutrition Institute). Soil samples for nutrient analysis should be taken from the main root zone. Even though almond roots may grow to a depth of 5 to 7 feet [K2], the majority of the roots can be found in the top two feet of the profile [K2, K16]. The lateral root expansion may reach 8 to 12 feet from the trunk with the highest density being found within 4 to 5 feet of the trunk in the zone wetted by the irrigation system [K2, K16]. For detailed sampling instructions see Soil Sampling in Orchards. Potassium availability is generally assessed by extracting a soil sample with ammonium acetate. A response to K fertilization is likely when the extractable K is below 150 ppm (see Table). Almonds growing on soils with extractable K values of 150-250 ppm are not likely to respond to K fertilization [K17]. In this case, the amount of K removed with the harvested nuts should be replaced. With each 1000 lbs of harvested kernels, 74 to 82 lbs K/acre (90 to 100 lbs K2O /acre) are removed from the orchard with kernels, shells and hulls [K6]. Similar values have been reported from studies carried out in Spain [K25, K26]. For low soil test K values, the application rate should be increased, while it can be reduced for high values. A reasonable approach is to increase K applications by 50 or 100% when the soil K test value is low or very low, respectively, and to reduce the application rate to 50 or 0% if the soil K test value is high or excessive, respectively. Over the years, the soil K test values should reach and remain at the intermediate level. Regular soil analyses indicate whether the K fertilization program is adequate. Contact your local farm advisor for more information. Interpretation of soil P and K test results [K17]. It’s good practice to bring a notepad along to record tree vigor in the different blocks. The information together with the laboratory analyses and yield data can help with future fertility planning [K21]. Potassium values below 1% dry weight indicate deficiency [K3]. Potassium deficiency decreases overall flower number due to increased spur mortality, but has little effect on percentage fruit set and fruit weight [K22, K23]. For this reason, very low July leaf K concentrations will likely reduce yields in subsequent years but not in the current year [K22, K23]. Critical nutrient levels in almond leaves sampled in July [K3, K4, K27]. Based on experimentally derived data, the almond fertilization model suggests decreasing the K2O application rate by 4 lbs/acre for each 0.1% increase in leaf K concentration between 2 and 3% [K5, K8]. Little information is available about the K demand of young almond trees. Using blends, such as 15-15-15 or 12-12-12 is a good way to supply some P and K to first and second-leaf trees [K12, K18]. In areas where soils are known to fix K, such as the east side of the San Joaquin Valley, analyzing the soil for its K fixation capacity before the orchard is planted helps adjust the K fertilization program. A discussion about K fixation in the San Joaquin Valley can be found here. For more information about soil K availability in your area, contact your local farm advisor. The amount of fertilizer added with blends and the time of application are generally based on the N demand of young trees. Granular fertilizers should be placed at least 18 inches from the trunk, but within the wetting zone of the irrigation system [K18]. For intermediate soil test K values, the amount of K removed at harvest should be replaced with fertilizer. With each 1000 lbs of harvested kernels, 70 to 80 lbs K/acre (85 to 95 lbs K2O/acre) are removed from the orchard with kernels, shells and hulls [K7, K25, K26]. However, in a trial carried out in Arbuckle in an orchard with adequate soil test K levels but often low leaf K concentrations, Edstrom and coworkers [K15] found that increasing the application rate from 100 to 200 lbs K/acre had no effect on yield, which averaged 2600 lbs/acre. Both treatments however tended to increase the yield compared to the unfertilized control [K15]. For low soil test K values, the application rates should be increased, while for high values it can be reduced (see Soil Test). Contact your local farm advisor for more information. Granular K fertilizer can be surface applied in a band approximately 1.2 m from the tree row, usually in the herbicide strip. The band needs to be in the area wetted by the irrigation system [K15]. However, surface applied K may be held in the top few inches of clay-rich soils, making it less available to the roots [K9]. Granular K fertilizer can also be drilled 6 to 8 inches deep in one or two bands on opposite sides of the tree row [K3]. In drip-irrigated orchards, applying K directly through the drip system is the most convenient approach. In-season applications of potassium chloride should be approached with caution due to chloride toxicity [K13, K15]. However, fertigation with potassium chloride is a successful practice in many orchards. When applied with the irrigation water, potassium thiosulfate (KTS) should be applied frequently at low rates, as high rates may damage the trees [K11]. In a trial carried out on a gravelly loam in Arbuckle, Edstrom and coworkers [K15] found no difference between a surface band application of granular fertilzer in fall and an in-season injection of 200 lbs K/acre in the form of potassium sulfate. In K fixing soils, band applied K should be placed in the same location each year to lower the need to overwhelm the soils ability to fix K [K20]. Fertigation with drip systems has the same effect. A discussion about K fixation in the San Joaquin Valley can be found here. 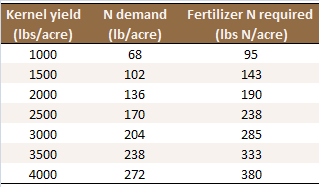 A number of K fertilizers are available to growers (see Table). Potassium from mineral fertilizers is readily available and the fertilizers differ little in their effect on yield. Brown and coworkers have not found any difference in yield and leaf K concentrations between trees fertilized with potassium thiosulfate, potassium sulfate, or potassium chloride [K6]. This is in line with Edstrom and coworkers [K15] who compared in-season injection of potassium sulfate, potassium thiosulfate and mono potassium phosphate. Mono potassium sulfate tended to increase yield compared to the other fertilizers. However, the difference was only significant in one out of four years [K15]. Liquid potassium chloride, potassium sulfate and potassium thiosulfate are commonly applied with the irrigation water during the growing season. Large quantities of granular potassium chloride should be applied in fall so that chloride, which may cause phytotoxicity, can be leached during the winter (see Time of Application) [K10]. Potassium carbonate buffers acidic soils, while potassium thiosulfate acidifies the soil [K13]. Granular potassium chloride and potassium sulfate are most commonly applied in November after leaf drop begins [K10]. When only low amounts of K are needed, K can be applied every 2 to 3 years. In sandy soils with a low cation exchange capacity, K may be leached during the winter. In these soils, K is better applied in multiple smaller applications made throughout the year, matching the N program [K13]. To avoid chloride toxicity, granular potassium chloride should be applied when no active leaves are left on the tree [K10]. Potassium chloride should not be used on weak trees, young trees, or in orchards with water tables, hardpans, stratified soils or any restriction which would prevent chloride from leaching out of the root zone [K10]. Approximately 10 inches of rainfall or winter irrigation is recommended to leach chloride out of the root zone [K10]. To micro-irrigated trees, K can be applied during the growing season with the irrigation water. 70% of K is accumulated in the almond fruit by mid June [K7]. Therefore, most of the K should be applied between bloom and mid June. The effects of foliar K applications to almonds have not been studies widely. Up to three foliar applications of different combinations of N, P and K had no consistent effects on kernel yield and leaf nutrient concentrations in a two-year study carried out in an orchard on an Arbuckle gravelly loam [K19]. Almond meat yields ranges from 1500 to 2100 lbs/acre. In this study, foliar fertilizers were applied pre-bloom, when the tip of the bloom was pink, 30 days later and 60 days after the pre-bloom application [K19]. Boron is essential for pollen tube germination and fertilization [B12]. Moderate B deficiency does not produce recognizable symptoms on leafs, but results in low fruit set and excessive nut drop [B3]. Severe B deficiency commonly results in leaf scorch and drop, especially on watersprouts and other vigorous shoots. The tips of the affected leaves usually curl up and the tips of the injured shoots die back [B11, B3]. While the tips of the branch may die, lateral shoots farther down may grow giving a brushy appearance [B11]. Brown gummy areas may develop in B deficient nuts (see pictures). The affected area is usually limited to the shell, but in some cases, gum may be extruded to the surface. These symptoms are especially common in Peerless almonds [B3]. The embryos in injured nuts usually abort, resulting in nut drop in May or June [B11]. Exudates on nuts caused by boron deficiency (photo provided by Patrick Brown). In California, B deficiency is most common on recent alluvial soils in the upper Sacramento Valley and in the northern San Joaquin Valley, east of the San Joaquin River [B3, B8]. Orchards on light textured soils irrigated with low B water are especially at risk of B deficiency [B16]. For more information about soil B availability in your area, contact your local farm advisor. Excessive boron can cause gummy exudates and necrotic areas on young shoots [B3]. In addition, B toxicity can cause shoot dieback and gummy hulls, twigs, and kernels [B1, B3, B7]. Toxicity can occur when hull levels are above 200 ppm [B7]. Boron generally exists in soils as a non-charged acid in acidic soils and as an anion in alkaline soils. It is therefore easily leached. Leaching is more likely to occur in sandy soils, particularly in areas with higher rainfall or low salt irrigation water [B10]. For detailed sampling instructions see Soil Sampling in Orchards). Hot water extracts are used to detect B deficiency, while a saturated soil paste is used to assess B toxicity [B10]. An intermediate soil B level is optimal (see Table). Interpretation of B levels in the top 6 inches of soil [B4]. Hull samples taken at harvest are a better indicator of tree B status than July leaf analyses [B12, B16]. Samples should not be collected much earlier than harvest, as B continues to accumulate in the hulls as long as they remain green on the tree [B6]. Boron is likely deficient when the concentration in hulls is below 80 ppm (see Table). In this case, a soil application of B may be best [B9]. Hull B concentrations between 80 and 150 ppm are considered adequate. However, postharvest foliar applications to trees with up to 120 ppm B in the hulls may increase nut set and yield by 20-30% the following year compared to non-treated trees [B6, B17]. Toxicity can occur when hull levels increase above 200 ppm B [B7]. If B concentrations are excessively high despite low fertilization rates, the source of B may be the irrigation water. A water analysis to determine B concentration should be performed [B7]. When the soil test suggests low B availability, granular B fertilizer can be applied and incorporated into the soil before planting. With a kernel yield of 2500 lbs/acre approximately 0.5 lb B/acre are removed from the orchard [B14]. Hull boron concentrations below 80 ppm indicate the need for a ground application [B9]. Boron deficiency can be corrected by broadcasting agricultural borax at a rate of 50 to 75 lbs/acre every 3 to 5 years [B3]. This application rate corresponds to 5.5 to 8.3 lbs B/acre. In sandy soils with a high leaching potential, lower but more frequent applications of 2-4 lbs B/acre are more efficient [B9]. Granular B fertilizers should be broadcast, not banded [B6]. Liquid or soluble B fertilizers can be applied through the irrigation system or sprayed on the ground. Applying B together with an herbicide is possible; however, fertilizers containing B in the form of polyborate may increase solution pH [B19]. Therefore, when applied with glyphosate or other pH sensitive herbicides, the water needs to be buffered before the addition of the herbicide [B9]. Granular B fertilizer is most commonly applied to the soil in fall. Fall application of soil applied B can increase hull B levels the following year and flower B levels in the second year if appropriate rates are used [B15]. Liquid formulations can be applied to the soil in spring or fertigated. While B deficiency (indicated by hull B concentrations below 80 ppm) is best corrected with soil applications, trees with hull boron levels between 80 and 120 ppm may benefit from a post-harvest foliar application [B6, B9]. In an orchard with low soil B in Fresno County, post-harvest B applications enhanced pollen germination, tube growth and fruit set. The optimal application rate was 0.7-1.5 lbs B/acre applied with 350 gallons/acre of water (0.2-0.4 lbs/100 gallons) [B16, B18]. It appears that the B concentration in the water applied is also important [B6]. With 100 gallons of water applied per acre, a foliar application of 0.2-0.4 lbs B/acre has shown good results, while concentrations above 0.4-0.6 lbs B/acre may actually reduce fruit set and yield [B6, B12, B15]. Contact your local farm advisor for more information. The best results have been obtained with 1-2 lbs of Solubor® (20% B) per 100 gallons of water or the same amount of actual B (0.2-0.4 lbs B) with other products [B6]. In contrast to other trees, such as pistachio and walnut, B is mobile in almond trees. For this reason, foliar B applied post-harvest is absorbed by the leaves and translocated to flower buds [B2]. Nyomora and coworkers [B17] found that September (post-harvest) B applications were more effective in increasing tissue B concentration, fruit set, and yield in almond than applications in December (dormancy), February (budbreak) or August (early hull split). Pre-bloom applications at bud swell may be an alternative [B13], but seem to be less effective than post-harvest applications [B6]. Spraying flowers with boron at early or full bloom is not effective and can reduce nut set [B12]. The optimal time for a fall foliar B application is from well after hull split until the leaves become inactive [B6]. Foliar boron applied before hull split is translocated to the hulls and therefore removed from the orchard at harvest [B6]. Post harvest foliar applications need to be repeated annually [B5, B12].